This is a diamond shaped Auto Club of Southern California porcelain sign. This particular Auto Club of Southern California sign is predominantly white with blue text. 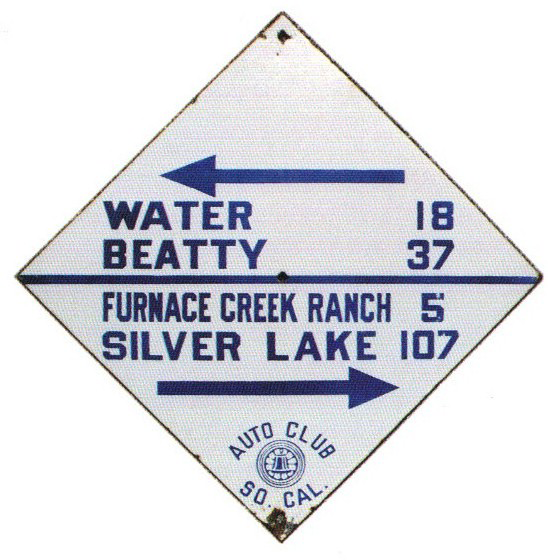 It reads, “Water 18, Beatty 37, Furnace Creek Ranch 5, Silver Lake 107, Auto Club of So. Cal.” and features two blue arrows along with seal of the Auto Club of Southern California.